Copyright © 2004-2014 W3C® (MIT, ERCIM, Keio, Beihang), All Rights Reserved. W3C liability, trademark and document use rules apply. This document defines an XML syntax for RDF called RDF/XML in terms of Namespaces in XML, the XML Information Set and XML Base. This document is an edited version of the 2004 RDF XML Syntax Specification Recommendation. The purpose of this revision is to make this document available as part of the RDF 1.1 document set. Changes are limited to revised references, terminology updates, and adaptations to the introduction. The technical content of the document is unchanged, except for the fact that the datatype XMLLiiteral is marked as non-normative in RDF 1.1. The (non-normative) algorithm for parsing XMLLiteral (Sec. 7.2.17) has been updated to be in line with the current state of XML technology. Details of the changes are listed in the Changes section. Since the edits to this document do not invalidate previous implementations the Director decided no new implementation report was required. This document was published by the RDF Working Group as a Recommendation. If you wish to make comments regarding this document, please send them to public-rdf-comments@w3.org (subscribe, archives). All comments are welcome. 2.11 Omitting Blank Nodes: rdf:parseType="Resource"
This document defines the XML [ XML10 ] syntax for RDF graphs. This document revises the original RDF/XML grammar [ RDFMS ] in terms of XML Information Set [ XML-INFOSET ] information items which moves away from the rather low-level details of XML, such as particular forms of empty elements. This allows the grammar to be more precisely recorded and the mapping from the XML syntax to the RDF Graph more clearly shown. The mapping to the RDF graph is done by emitting statements in the N-Triples [ N-TRIPLES ] format. A document describing RDF Schema [ RDF11-SCHEMA ], which provides a data-modeling vocabulary for RDF data. For a longer introduction to the RDF/XML syntax with a historical perspective, see "RDF: Understanding the Striped RDF/XML Syntax" [ STRIPEDRDF ]. This section introduces the RDF/XML syntax, describes how it encodes RDF graphs and explains this with examples. If there is any conflict between this informal description and the formal description of the syntax and grammar in sections 6 Syntax Data Model and 7 RDF/XML Grammar, the latter two sections take precedence. The RDF Concepts and Abstract Syntax document [ RDF11-CONCEPTS ] defines the RDF Graph data model and the RDF Graph abstract syntax. Along with the RDF Semantics [ RDF11-MT ] this provides an abstract syntax with a formal semantics for it. The RDF graph has nodes and labeled directed arcs that link pairs of nodes and this is represented as a set of RDF triples where each triple contains a subject node, predicate and object node. Nodes are IRIs, literals, or blank nodes. Blank nodes may be given a document-local identifier called a blank node identifier. Predicates are IRIs and can be interpreted as either a relationship between the two nodes or as defining an attribute value (object node) for some subject node. The IRI represented by a QName is determined by appending the local name part of the QName after the namespace name (IRI) part of the QName. This is used to shorten the IRI of all predicates and some nodes. IRIs identifying subject and object nodes can also be stored as XML attribute values. RDF literals which can only be object nodes, become either XML element text content or XML attribute values. A graph can be considered a collection of paths of the form node, predicate arc, node, predicate arc, node, predicate arc, ... node which cover the entire graph. In RDF/XML these turn into sequences of elements inside elements which alternate between elements for nodes and predicate arcs. This has been called a series of node/arc stripes. The node at the start of the sequence turns into the outermost element, the next predicate arc turns into a child element, and so on. The stripes generally start at the top of an RDF/XML document and always begin with nodes. Several RDF/XML examples are given in the following sections building up to complete RDF/XML documents. Example 7 is the first complete RDF/XML document. An RDF graph is given in Figure 1 where the nodes are represented as ovals and contain their IRIs where they have them, all the predicate arcs are labeled with IRIs and string literals nodes have been written in rectangles. In RDF/XML, the sequence of 5 nodes and predicate arcs on the left hand side of Figure 2 corresponds to the usage of five XML elements of two types, for the graph nodes and predicate arcs. These are conventionally called node elements and property elements respectively. In the striping shown in Example 1, rdf:Description is the node element (used three times for the three nodes) and ex:editor and ex:homePage are the two property elements. There are several abbreviations that can be used to make common uses easier to write down. In particular, it is common that a subject node in the RDF graph has multiple outgoing predicate arcs. RDF/XML provides an abbreviation for the corresponding syntax when a node element about a resource has multiple property elements. This can be abbreviated by using multiple child property elements inside the node element describing the subject node. When a predicate arc in an RDF graph points to an object node which has no further predicate arcs, which appears in RDF/XML as an empty node element <rdf:Description rdf:about="..."> </rdf:Description> (or <rdf:Description rdf:about="..." />) this form can be shortened. This is done by using the IRI of the object node as the value of an XML attribute rdf:resource on the containing property element and making the property element empty. When a property element's content is string literal, it may be possible to use it as an XML attribute on the containing node element. This can be done for multiple properties on the same node element only if the property element name is not repeated (required by XML — attribute names are unique on an XML element) and any in-scope xml:lang on the property element's string literal (if any) are the same (see Section 2.7) This abbreviation is known as a Property Attribute and can be applied to any node element. This abbreviation can also be used when the property element is rdf:type and it has an rdf:resource attribute the value of which is interpreted as a IRI object node. To create a complete RDF/XML document, the serialization of the graph into XML is usually contained inside an rdf:RDF XML element which becomes the top-level XML document element. Conventionally the rdf:RDF element is also used to declare the XML namespaces that are used, although that is not required. When there is only one top-level node element inside rdf:RDF, the rdf:RDF can be omitted although any XML namespaces must still be declared. The XML specification also permits an XML declaration at the top of the document with the XML version and possibly the XML content encoding. This is optional but recommended. It is possible to omit rdf:RDF in Example 7 above since there is only one rdf:Description inside rdf:RDF but this is not shown here. RDF/XML permits the use of the xml:lang attribute as defined by 2.12 Language Identification of XML 1.0 [ XML10 ] to allow the identification of content language. The xml:lang attribute can be used on any node element or property element to indicate that the included content is in the given language. Typed literals which includes XML literals are not affected by this attribute. The most specific in-scope language present (if any) is applied to property element string literal content or property attribute values. The xml:lang="" form indicates the absence of a language identifier. RDF allows XML literals [RDF11-CONCEPTS] to be given as the object node of a predicate. These are written in RDF/XML as content of a property element (not a property attribute) and indicated using the rdf:parseType="Literal" attribute on the containing property element. An example of writing an XML literal is given in Example 9 where there is a single RDF triple with the subject node IRI http://example.org/item01, the predicate IRI http://example.org/stuff/1.0/prop (from ex:prop) and the object node with XML literal content beginning a:Box. RDF allows typed literals to be given as the object node of a predicate. Typed literals consist of a literal string and a datatype IRI. These are written in RDF/XML using the same syntax for literal string nodes in the property element form (not property attribute) but with an additional rdf:datatype="datatypeURI" attribute on the property element. Any IRI can be used in the attribute. An example of an RDF typed literal is given in Example 10 where there is a single RDF triple with the subject node IRI http://example.org/item01, the predicate IRI http://example.org/stuff/1.0/size (from ex:size) and the object node with the typed literal ("123", http://www.w3.org/2001/XMLSchema#int) to be interpreted as an XML Schema [ XMLSCHEMA-2 ] datatype int. Blank nodes in the RDF graph are distinct but have no IRI identifier. It is sometimes required that the same graph blank node is referred to in the RDF/XML in multiple places, such as at the subject and object of several RDF triples. In this case, a blank node identifier can be given to the blank node for identifying it in the document. Blank node identifiers in RDF/XML are scoped to the containing XML Information Set document information item. A blank node identifier is used on a node element to replace rdf:about="IRI" or on a property element to replace rdf:resource="IRI" with rdf:nodeID="blank node identifier" in both cases. Taking Example 7 and explicitly giving a blank node identifier of abc to the blank node in it gives the result shown in Example 11. The second rdf:Description property element is about the blank node. Blank nodes (not IRI nodes) in RDF graphs can be written in a form that allows the <rdf:Description> </rdf:Description> pair to be omitted. The omission is done by putting an rdf:parseType="Resource" attribute on the containing property element that turns the property element into a property-and-node element, which can itself have both property elements and property attributes. Property attributes and the rdf:nodeID attribute are not permitted on property-and-node elements. If all of the property elements on a blank node element have string literal values with the same in-scope xml:lang value (if present) and each of these property elements appears at most once and there is at most one rdf:type property element with a IRI object node, these can be abbreviated by moving them to be property attributes on the containing property element which is made an empty element. Taking the earlier Example 5, the ex:editor property element contains a blank node element with two property elements ex:fullname and ex:homePage. ex:homePage is not suitable here since it does not have a string literal value, so it is being ignored for the purposes of this example. The abbreviated form removes the ex:fullName property element and adds a new property attribute ex:fullName with the string literal value of the deleted property element to the ex:editor property element. The blank node element becomes implicit in the now empty ex:editor property element. The result is shown in Example 13. It is common for RDF graphs to have rdf:type predicates from subject nodes. These are conventionally called typed nodes in the graph, or typed node elements in the RDF/XML. RDF/XML allows this triple to be expressed more concisely. by replacing the rdf:Description node element name with the namespaced-element corresponding to the IRI of the value of the type relationship. There may, of course, be multiple rdf:type predicates but only one can be used in this way, the others must remain as property elements or property attributes. The typed node elements are commonly used in RDF/XML with the built-in classes in the RDF vocabulary: rdf:Seq, rdf:Bag, rdf:Alt, rdf:Statement, rdf:Property and rdf:List. For example, the RDF/XML in Example 14 could be written as shown in Example 15. RDF/XML allows further abbreviating IRIs in XML attributes in two ways. The XML Infoset provides a base URI attribute xml:base that sets the base URI for resolving relative IRIs, otherwise the base URI is that of the document. The base URI applies to all RDF/XML attributes that deal with IRIs which are rdf:about, rdf:resource, rdf:ID and rdf:datatype. The rdf:ID attribute on a node element (not property element, that has another meaning) can be used instead of rdf:about and gives a relative IRI equivalent to # concatenated with the rdf:ID attribute value. So for example if rdf:ID="name", that would be equivalent to rdf:about="#name". rdf:ID provides an additional check since the same name can only appear once in the scope of an xml:base value (or document, if none is given), so is useful for defining a set of distinct, related terms relative to the same IRI. Both forms require a base URI to be known, either from an in-scope xml:base or from the URI of the RDF/XML document. Example 16 shows abbreviating the node IRI of http://example.org/here/#snack using an xml:base of http://example.org/here/ and an rdf:ID on the rdf:Description node element. The object node of the ex:prop predicate is an absolute IRI resolved from the rdf:resource XML attribute value using the in-scope base URI to give the IRI http://example.org/here/fruit/apple. RDF has a set of container membership properties and corresponding property elements that are mostly used with instances of the rdf:Seq, rdf:Bag and rdf:Alt classes which may be written as typed node elements. The list properties are rdf:_1, rdf:_2 etc. and can be written as property elements or property attributes as shown in Example 17. There is an rdf:li special property element that is equivalent to rdf:_1, rdf:_2 in order, explained in detail in section 7.4. The mapping to the container membership properties is always done in the order that the rdf:li special property elements appear in XML — the document order is significant. The equivalent RDF/XML to Example 17 written in this form is shown in Example 18. RDF/XML allows an rdf:parseType="Collection" attribute on a property element to let it contain multiple node elements. These contained node elements give the set of subject nodes of the collection. This syntax form corresponds to a set of triples connecting the collection of subject nodes, the exact triples generated are described in detail in Section 7.2.19 Production parseTypeCollectionPropertyElt. The collection construction is always done in the order that the node elements appear in the XML document. Whether the order of the collection of nodes is significant is an application issue and not defined here. Example 19 shows a collection of three nodes elements at the end of the ex:hasFruit property element using this form. Complete example of a RDF collection of nodes using rdf:parseType="Collection"
The rdf:ID attribute can be used on a property element to reify the triple that it generates (See section 7.3 Reification Rules for the full details). The identifier for the triple should be constructed as a IRI made from the relative IRI # concatenated with the rdf:ID attribute value, resolved against the in-scope base URI. So for example if rdf:ID="triple", that would be equivalent to the IRI formed from relative IRI #triple against the base URI. Each (rdf:ID attribute value, base URI) pair has to be unique in an RDF/XML document, see constraint-id. Example 20 shows a rdf:ID being used to reify a triple made from the ex:prop property element giving the reified triple the IRI http://example.org/triples/#triple1. The key words "MUST", "MUST NOT", "REQUIRED", "SHALL", "SHALL NOT", "SHOULD", "SHOULD NOT", "RECOMMENDED", "MAY", and "OPTIONAL" in this document are to be interpreted as described in RFC 2119 [ RFC2119 ]. All use of string without further qualification refers to a Unicode [ UNICODE ] character string; a sequence of characters represented by a code point in Unicode. The Internet media type / MIME type for RDF/XML is application/rdf+xml — RFC 3023 [ RFC3023 ], section 8.18. It is recommended that RDF/XML files have the extension ".rdf" (all lowercase) on all platforms. It is recommended that RDF/XML files stored on Macintosh HFS file systems be given a file type of "rdf " (all lowercase, with a space character as the fourth letter). where n is a decimal integer greater than zero with no leading zeros. Any other names are not defined and SHOULD generate a warning when encountered, but should otherwise behave normally. Within RDF/XML documents it is not permitted to use XML namespaces whose namespace name is the ·RDF namespace IRI· concatenated with additional characters. IRIs can act as node (both subject and object) and as predicate. transformed from rdf:ID attribute values. Within RDF/XML, XML QNames are transformed into IRIs by appending the XML local name to the namespace name (IRI). For example, if the XML namespace prefix foo has namespace name (IRI) http://example.org/somewhere/ then the QName foo:bar would correspond to the IRI http://example.org/somewhere/bar. Note that this restricts which IRIs can be made and the same IRI can be given in multiple ways. Literals can only act as object nodes. Literals always have a datatype. Language-tagged strings get the datatype rdf:langString. When there is no language tag or datatype specified the literal is assumed to have the datatype xsd:string. Blank nodes can act as subject node and as object node. Blank nodes have distinct identity in the RDF graph. When the graph is written in a syntax such as RDF/XML, these blank nodes may need graph-local identifiers and a syntax in order to preserve this distinction. These local identifiers are called blank node identifiers and are used in RDF/XML as values of the rdf:nodeID attribute with the syntax given in Production nodeIdAttr. Blank node identifiers in RDF/XML are scoped to the XML Information Set document information item. If no blank node identifier is given explicitly as an rdf:nodeID attribute value then one will need to be generated (using generated-blank-node-id, see section 6.3.3). Such generated blank node identifiers must not clash with any blank node identifiers derived from rdf:nodeID attribute values. This can be implemented by any method that preserves the distinct identity of all the blank nodes in the graph, that is, the same blank node identifier is not given for different blank nodes. One possible method would be to add a constant prefix to all the rdf:nodeID attribute values and ensure no generated blank node identifiers ever used that prefix. Another would be to map all rdf:nodeID attribute values to new generated blank node identifiers and perform that mapping on all such values in the RDF/XML document. RDF/XML supports XML Base [ XMLBASE ] which defines a ·base-uri· accessor for each ·root event· and ·element event·. Relative IRIs are resolved into IRIs according to the algorithm specified in [ XMLBASE ] (and RFC 2396). These specifications do not specify an algorithm for resolving a fragment identifier alone, such as #foo, or the empty string "" into an IRI. In RDF/XML, a fragment identifier is transformed into an IRI by appending the fragment identifier to the in-scope base URI. The empty string is transformed into an IRI by substituting the in-scope base URI. An empty same document reference "" resolves against the URI part of the base URI; any fragment part is ignored. See Uniform Resource Identifiers (URI) [ RFC3986 ]. Implementation Note (Informative): When using a hierarchical base URI that has no path component (/), it must be added before using as a base URI for resolving. Each application of production idAttr matches an attribute. The pair formed by the ·string-value· accessor of the matched attribute and the ·base-uri· accessor of the matched attribute is unique within a single RDF/XML document. The syntax of the names must match the rdf-id production. An RDF Document is a serialization of an RDF Graph into a concrete syntax. An RDF/XML Document is an RDF Document written in the XML syntax for RDF as defined in this document. An RDF/XML Document is a conforming RDF/XML document if it adheres to the specification defined in this document. This document specifies the syntax of RDF/XML as a grammar on an alphabet of symbols. The symbols are called events in the style of the XPATH Information Set Mapping. A sequence of events is normally derived from an XML document, in which case they are in document order as defined below in Section 6.2 Information Set Mapping. The sequence these events form are intended to be similar to the sequence of events produced by the [ SAX ] XML API from the same XML document. Sequences of events may be checked against the grammar to determine whether they are or are not syntactically well-formed RDF/XML. The grammar productions may include actions which fire when the production is recognized. Taken together these actions define a transformation from any syntactically well-formed RDF/XML sequence of events into an RDF graph represented in the N-Triples [ N-TRIPLES ] language. The model given here illustrates one way to create a representation of an RDF Graph from an RDF/XML document. It does not mandate any implementation method — any other method that results in a representation of the same RDF Graph may be used. This specification permits any representation of an RDF graph; in particular, it does not require the use of N-Triples [ N-TRIPLES ]. This specification places no constraints on the order in which software transforming RDF/XML into a representation of a graph, constructs the representation of the graph. Software transforming RDF/XML into a representation of a graph MAY eliminate duplicate predicate arcs. The syntax does not support non-well-formed XML documents, nor documents that otherwise do not have an XML Information Set; for example, that do not conform to Namespaces in XML [ XML-NAMES ]. Other information items and properties have no mapping to syntax data model events. Element information items with reserved XML Names (See Name in XML 1.0) are not mapped to data model element events. These are all those with property [prefix] beginning with xml (case independent comparison) and all those with [prefix] property having no value and which have [local name] beginning with xml (case independent comparison). All information items contained inside XML elements matching the parseTypeLiteralPropertyElt production form XML literals and do not follow this mapping. See parseTypeLiteralPropertyElt for further information. This section is intended to satisfy the requirements for Conformance in the [ XML-INFOSET ] specification. It specifies the information items and properties that are needed to implement this specification. There are nine types of event defined in the following subsections. Most events are constructed from an Infoset information item (except for IRI, blank node, plain literal and typed literal). The effect of an event constructor is to create a new event with a unique identity, distinct from all other events. Events have accessor operations on them and most have the string-value accessor that may be a static value or computed. Constructed from a document information item and takes the following accessors and values. Set to the value of document information item property [document-element]. Set to the value of document information item property [children]. Set to the value of document information item property [base URI]. Set to the empty string. Set to the value of element information item property [local name]. Set to the value of element information item property [namespace name]. Set to the value of element information item property [children]. Set to the value of element information item property [parent]. Set to the value of element information item property [base URI]. Made from the value of element information item property [attributes] which is a set of attribute information items. If this set contains an attribute information item xml:lang ( [namespace name] property with the value "http://www.w3.org/XML/1998/namespace" and [local name] property value "lang") it is removed from the set of attribute information items and the ·language· accessor is set to the [normalized-value] property of the attribute information item. All remaining reserved XML Names (see Name in XML 1.0) are now removed from the set. These are, all attribute information items in the set with property [prefix] beginning with xml (case independent comparison) and all attribute information items with [prefix] property having no value and which have [local name] beginning with xml (case independent comparison) are removed. Note that the [base URI] accessor is computed by XML Base before any xml:base attribute information item is deleted. The remaining set of attribute information items are then used to construct a new set of Attribute Events which is assigned as the value of this accessor. Set to the string value of the concatenation of the value of the namespace-name accessor and the value of the local-name accessor. The value is the concatenation of the following in this order "<", the escaped value of the ·URI· accessor and ">". The escaping of the ·URI· accessor uses the N-Triples escapes for IRIs [[N_TRIPLES]]. Set to the integer value 1. Set from the ·attributes· as described above. If no value is given from the attributes, the value is set to the value of the language accessor on the parent event (either a Root Event or an Element Event), which may be the empty string. Has no initial value. Takes a value that is an Identifier event. This accessor is used on elements that deal with one node in the RDF graph, this generally being the subject of a statement. Has no accessors. Marks the end of the containing element in the sequence. Set to the value of attribute information item property [local name]. Set to the value of attribute information item property [namespace name]. Set to the value of the attribute information item property [normalized value] as specified by [ XML10 ] (if an attribute whose normalized value is a zero-length string, then the string-value is also a zero-length string). If ·namespace-name· is present, set to a string value of the concatenation of the value of the ·namespace-name· accessor and the value of the ·local-name· accessor. Otherwise if ·local-name· is ID, about, resource, parseType or type, set to a string value of the concatenation of the ·RDF namespace IRI· and the value of the ·local-name· accessor. Other non-namespaced ·local-name· accessor values are forbidden. The support for a limited set of non-namespaced names is REQUIRED and intended to allow RDF/XML documents specified in [ RDFMS ] to remain valid; new documents SHOULD NOT use these unqualified attributes and applications MAY choose to warn when the unqualified form is seen in a document. The construction of IRIs from XML attributes can generate the same IRIs from different XML attributes. This can cause ambiguity in the grammar when matching attribute events (such as when rdf:about and about XML attributes are both present). Documents that have this are illegal. The escaping of the ·URI· accessor uses the N-Triples escapes for IRIs [ N-TRIPLES ]. Set to the value of the string made from concatenating the [character code] property of each of the character information items. Takes a string value used as an IRI. The value is the concatenation of "<", the escaped value of the ·identifier· accessor and ">"
The escaping of the ·identifier· accessor value uses the N-Triples escapes for IRIs [ N-TRIPLES ]. These events are constructed by giving a value for the ·identifier· accessor. For further information on identifiers in the RDF graph, see section 5.2. The value is a function of the value of the ·identifier· accessor. The value begins with "_:" and the entire value MUST match the N-Triples BLANK_NODE_LABELD production. The function MUST preserve distinct blank node identity as discussed in in section 5.2 Identifiers. RDF/XML plain literals are in RDF 1.1 treated as syntactic sugar for a literal with datatype xsd:string (in case no language tag is present) or as a literal with datatype rdf:langString (in case a language tag is present). The mapping to N-Triples as defined in this subsection is not affected by this change. Takes a string value used as a language tag in an RDF plain literal. The value is calculated from the other accessors as follows. If ·literal-language· is the empty string then the value is the concatenation of """ (1 double quote), the escaped value of the ·literal-value· accessor and """ (1 double quote). Otherwise the value is the concatenation of """ (1 double quote), the escaped value of the ·literal-value· accessor ""@" (1 double quote and a '@'), and the value of the ·literal-language· accessor. The escaping of the ·literal-value· accessor value uses the N-Triples escapes for strings as described in [ N-TRIPLES ] for escaping certain characters such as ". These events are constructed by giving values for the ·literal-value· and ·literal-language· accessors. Interoperability Note (Informative): Literals beginning with a Unicode combining character are allowed however they may cause interoperability problems. See [ CHARMOD ] for further information. The value is the concatenation of the following in this order """ (1 double quote), the escaped value of the ·literal-value· accessor, """ (1 double quote), "^^<", the escaped value of the ·literal-datatype· accessor and ">". The escaping of the ·literal-value· accessor value uses the N-Triples escapes for strings [ N-TRIPLES ] for escaping certain characters such as ". The escaping of the ·literal-datatype· accessor value must use the N-Triples escapes for IRI [ N-TRIPLES ]. These events are constructed by giving values for the ·literal-value· and ·literal-datatype· accessors. Implementation Note (Informative): In XML Schema (part 1) [ XMLSCHEMA-1 ], white space normalization occurs during validation according to the value of the whiteSpace facet. The syntax mapping used in this document occurs after this, so the whiteSpace facet formally has no further effect. To transform the Infoset into the sequence of events in document order, each information item is transformed as described above to generate a tree of events with accessors and values. Each element event is then replaced as described below to turn the tree of events into a sequence in document order. The value of the children accessor recursively transformed, a possibly empty ordered list of events. where the event-content is an expression matching event-types (as defined in Section 6.1), using notation given in the following sections. The number is used for reference purposes. The grammar action may include generating new triples to the graph, written in N-Triples [ N-TRIPLES ] format. The following sections describe the general notation used and that for event matching and actions. event.accessor The value of an event accessor. rdf:X A URI as defined in section 5.1. "ABC" A string of characters A, B, C in order. A == B Event accessor A matches expression B. A != B A is not equal to B. A | B | ... The A, B, ... terms are alternatives. A - B The terms in A excluding all the terms in B.
list(item1, item2, ...); list() An ordered list of events. An empty list. set(item1, item2, ...); set() An unordered set of events. An empty set. * Zero or more of preceding term.
? Zero or one of preceding term. + One or more of preceding term. acc2 == value2, ...) Match a Root Event with accessors. end-element() Match a sequence of Element Event with accessors, a possibly empty list of events as element content and an End Element Event. acc2 == value2, ...) Match an Attribute Event with accessors. text() Match a Text Event. A := B Assigns A the value B.
concat(A, B, ..) A string created by concatenating the terms in order. resolve(e, s) A string created by interpreting string s as a relative IRI to the ·base-uri· accessor of 6.1.2 Element Event e as defined in Section 5.3 Resolving URIs. The resulting string represents an IRI. generated-blank-node-id() A string value for a new distinct generated blank node identifier as defined in section 5.2 Identifiers. event.accessor := value Sets an event accessor to the given value. uri(identifier := value) Create a new URI Reference Event. bnodeid(identifier := value) Create a new Blank Node Identifier Event. See also section 5.2 Identifiers. literal-language := language, ...) Create a new Plain Literal Event. typed-literal(literal-value := string, ...) Create a new Typed Literal Event. If the RDF/XML is a standalone XML document (identified by presentation as an application/rdf+xml RDF MIME type object, or by some other means) then the grammar may start with production doc or production nodeElement. If the content is known to be RDF/XML by context, such as when RDF/XML is embedded inside other XML content, then the grammar can either start at Element Event RDF (only when an element is legal at that point in the XML) or at production nodeElementList (only when element content is legal, since this is a list of elements). For such embedded RDF/XML, the ·base-uri· value on the outermost element must be initialized from the containing XML since no Root Event will be available. Note that if such embedding occurs, the grammar may be entered several times but no state is expected to be preserved. A subset of the syntax terms from the RDF vocabulary in section 5.1 which are used in RDF/XML. All the syntax terms from the RDF vocabulary in section 5.1 which are used in RDF/XML. These are the names from the RDF vocabulary that have been withdrawn from the language. See the resolutions of Issue rdfms-aboutEach-on-object, Issue rdfms-abouteachprefix and Last Call Issue timbl-01 for further information. The IRIs that are allowed on node elements. The URIs that are allowed on property elements. The IRIs that are allowed on property attributes. If there is an attribute a with a.URI == rdf:ID, then e.subject := uri(identifier := resolve(e, concat("#", a.string-value))). If there is an attribute a with a.URI == rdf:nodeID, then e.subject := bnodeid(identifier:=a.string-value). If there is an attribute a with a.URI == rdf:about then e.subject := uri(identifier := resolve(e, a.string-value)). If e.subject is empty, then e.subject := bnodeid(identifier := generated-blank-node-id()). Handle the propertyEltList children events in document order. If element e has e.URI = rdf:li then apply the list expansion rules on element e.parent in section 7.4 to give a new URI u and e.URI := u. The action of this production must be done before the actions of any sub-matches (resourcePropertyElt ... emptyPropertyElt). Alternatively the result must be equivalent to as if it this action was performed first, such as performing as the first action of all of the sub-matches. Note that the empty literal case is defined in production emptyPropertyElt. If the rdf:ID attribute a is given, the above statement is reified with i := uri(identifier := resolve(e, concat("#", a.string-value))) using the reification rules in section 7.3 and e.subject := i. For element e and the literal l that is the rdf:parseType="Literal" content. l is not transformed by the syntax data model mapping into events (as noted in section 6 Syntax Data Model) but remains an XML Infoset of XML Information items. l is transformed into the lexical form of an XML literal in the RDF graph x (a Unicode string) by the following algorithm. This does not mandate any implementation method — any other method that gives the same result may be used. Use l to construct an XPath sequence [ XPATH-DATAMODEL-30 ]. Apply http://www.w3.org/TR/xpath-functions-30/#func-serialize [ XPATH-FUNCTIONS-30 ] to this sequence to give an xsd:string x. For element e with possibly empty element content c.
n := bnodeid(identifier := generated-blank-node-id()). If the rdf:ID attribute a is given, the statement above is reified with i := uri(identifier := resolve(e, concat("#", a.string-value))) using the reification rules in section 7.3 and e.subject := i. Then process the resulting sequence using production nodeElement. For element event e with possibly empty nodeElementList l. Set s:=list(). For each element event f in l, n := bnodeid(identifier := generated-blank-node-id()) and append n to s to give a sequence of events. If the rdf:ID attribute a is given, either of the the above statements is reified with i := uri(identifier := resolve(e, concat("#", a.string-value))) using the reification rules in section 7.3. If s is empty, no further work is performed. All rdf:parseType attribute values other than the strings "Resource", "Literal" or "Collection" are treated as if the value was "Literal". This production matches and acts as if production parseTypeLiteralPropertyElt was matched. No extra triples are generated for other rdf:parseType values. and then if i is given, the above statement is reified with uri(identifier := resolve(e, concat("#", i.string-value))) using the reification rules in section 7.3.
and then if rdf:ID attribute i is given, the above statement is reified with uri(identifier := resolve(e, concat("#", i.string-value))) using the reification rules in section 7.3. The string-value for the resulting event is discussed in section 7.2.17. For the given element e, create a new IRI u := concat("http://www.w3.org/1999/02/22-rdf-syntax-ns#_", e.li-counter), increment the e.li-counter property by 1 and return u. Use property names that cannot be turned into XML namespace-qualified names. An XML namespace-qualified name (QName) has restrictions on the legal characters such that not all property URIs can be expressed as these names. It is recommended that implementors of RDF serializers, in order to break a URI into a namespace name and a local name, split it after the last XML non-NCName character, ensuring that the first character of the name is a Letter or '_'. If the URI ends in a non-NCName character then throw a "this graph cannot be serialized in RDF/XML" exception or error. For example, a property with the same URI as any of the syntaxTerms production. This datatype as introduced in RDF 1.1 [ RDF11-CONCEPTS ]. Implementation Note (Informative): When an RDF graph is serialized to RDF/XML and has an XML Schema Datatype (XSD), it SHOULD be written in a form that does not require whitespace processing. XSD support is NOT required by RDF or RDF/XML so this is optional. There is a standardized approach for associating RDF compatible metadata with SVG — the metadata element which was explicitly designed for this purpose as defined in Section 21 Metadata of the Scalable Vector Graphics (SVG) 1.0 Specification [ SVG10 ] and Section 21 Metadata of the Scalable Vector Graphics (SVG) 1.1 Specification [ SVG11 ]. This document contains two example graphs in SVG with such embedded RDF/XML inside the metadata element: figure 1 and figure 2. Gavin Carothers provided the RDF 1.1 update for the Production parseTypeLiteralPropertyElt. Ivan Herman provided valuable comments and reworked Figs 1 and 2. This specification is a product of extended deliberations by the members of the RDFcore Working Group and the RDF and RDF Schema Working Group. This document is a product of extended deliberations by the RDF Core working group, whose members have included: Art Barstow (W3C) Dave Beckett (ILRT), Dan Brickley (W3C/ILRT), Dan Connolly (W3C), Jeremy Carroll (Hewlett Packard), Ron Daniel (Interwoven Inc), Bill dehOra (InterX), Jos De Roo (AGFA), Jan Grant (ILRT), Graham Klyne (Clearswift and Nine by Nine), Frank Manola (MITRE Corporation), Brian McBride (Hewlett Packard), Eric Miller (W3C), Stephen Petschulat (IBM), Patrick Stickler (Nokia), Aaron Swartz (HWG), Mike Dean (BBN Technologies / Verizon), R. V. Guha (Alpiri Inc), Pat Hayes (IHMC), Sergey Melnik (Stanford University), Martyn Horner (Profium Ltd). This specification also draws upon an earlier RDF Model and Syntax document edited by Ora Lassilla and Ralph Swick, and RDF Schema edited by Dan Brickley and R. V. Guha. RDF and RDF Schema Working group members who contributed to this earlier work are: Nick Arnett (Verity), Tim Berners-Lee (W3C), Tim Bray (Textuality), Dan Brickley (ILRT / University of Bristol), Walter Chang (Adobe), Sailesh Chutani (Oracle), Dan Connolly (W3C), Ron Daniel (DATAFUSION), Charles Frankston (Microsoft), Patrick Gannon (CommerceNet), RV Guha (Epinions, previously of Netscape Communications), Tom Hill (Apple Computer), Arthur van Hoff (Marimba), Renato Iannella (DSTC), Sandeep Jain (Oracle), Kevin Jones, (InterMind), Emiko Kezuka (Digital Vision Laboratories), Joe Lapp (webMethods Inc.), Ora Lassila (Nokia Research Center), Andrew Layman (Microsoft), Ralph LeVan (OCLC), John McCarthy (Lawrence Berkeley National Laboratory), Chris McConnell (Microsoft), Murray Maloney (Grif), Michael Mealling (Network Solutions), Norbert Mikula (DataChannel), Eric Miller (OCLC), Jim Miller (W3C, emeritus), Frank Olken (Lawrence Berkeley National Laboratory), Jean Paoli (Microsoft), Sri Raghavan (Digital/Compaq), Lisa Rein (webMethods Inc.), Paul Resnick (University of Michigan), Bill Roberts (KnowledgeCite), Tsuyoshi Sakata (Digital Vision Laboratories), Bob Schloss (IBM), Leon Shklar (Pencom Web Works), David Singer (IBM), Wei (William) Song (SISU), Neel Sundaresan (IBM), Ralph Swick (W3C), Naohiko Uramoto (IBM), Charles Wicksteed (Reuters Ltd.), Misha Wolf (Reuters Ltd.), Lauren Wood (SoftQuad). Replaced "(RDF) URI reference" with "IRI"
Changed links in Sec. 2 examples from relative URI to absolute URI; same for RELAX schema in Appendix. Sections concerning rdf:XMLLiteral (Sec. 2.8 and Sec. 7.2.17) marked as non-normative. Adapted Production parseTypeLiteralPropertyElt to cater for the non-normative status of rdf:XMLLiteral. Informative notes at start of Sec. 5.1 removed, as these have become irrelevant. Added new datatype rdf:HTML to the list of things that cannot be serialized in RDF/XML. Replaced the link to 2004 N-Triples nodeID production to the RDF 1.1 N-Triples BLANK_NODE_LABEL production. This appendix contains XML schemas for validating RDF/XML forms. These are example schemas for information only and are not part of this specification. This is an example schema in RELAX NG Compact (for ease of reading) for RDF/XML. Applications can also use the RELAX NG XML version. These formats are described in RELAX NG [ RELAXNG ] and RELAX NG Compact [ RELAXNG-COMPACT ]. The RNGC schema has been updated to attempt to match the grammar but this has not been checked or used to validate RDF/XML. # and updated with later changes. # but RELAXNG does this by default, ignoring whitespace separating tags. # beginning with _ in the rdf: namespace" in RELAX NG. Dan Brickley, R. V. Guha. RDF Schema 1.1 . W3C Recommendation, 25 February 2014. URL: http://www.w3.org/TR/2014/REC-rdf-schema-20140225/. The latest published version is available at http://www.w3.org/TR/rdf-schema/. MIME Media Types . The Internet Assigned Numbers Authority (IANA). The registration for application/rdf+xml is archived at http://www.w3.org/2001/sw/RDFCore/mediatype-registration. Ora Lassila; Ralph R. Swick. Resource Description Framework (RDF) Model and Syntax Specification . 22 February 1999. W3C Recommendation. URL: http://www.w3.org/TR/1999/REC-rdf-syntax-19990222. James Clark and Murata Makoto, editors. RELAX NG Specification . OASIS Committee Specification, 3 December 2001. Latest version: http://www.oasis-open.org/committees/relax-ng/spec.html. James Clark, editor. RELAX NG Compact Syntax . OASIS Committee Specification, 21 November 2002. URI: http://www.oasis-open.org/committees/relax-ng/compact-20021121.html. D. Brickley. 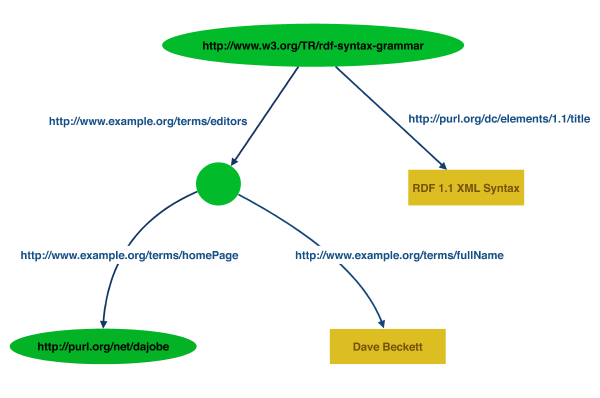 RDF: Understanding the Striped RDF/XML Syntax. W3C, 2001. URI: http://www.w3.org/2001/10/stripes/.